Mr. Micawber Enters The Internets: The new men's lit. The trend of chick-lit with its bubble-gum covers seems to have passed. And while I am usually hesitant to label most novels as his/her books, I am noticing a new trend. There is a new wave of young men writing novels that are, for lack of a better term, very masculine. It would be too easy to link these books to Hemingway or Raymond Carver. Yet that is what happens. I half-joked with Erin Kottke of Graywolf a week back that they were creating quite the stable of these new writers. Yet, it's true. In March of 2011 they will release a collection of stories by Alan Heathcock entitled "Volt" that seem to be wayward cousins of Percy's writing. All set in an unnamed locale, these are also stories that grab you and shake you and, ultimately, remind you that violence and tenderness are not mutually exclusive. It's possible that the success of Cormac McCarthy, in film and books(again), has led to this. Or it could be something else entirely. Creston Lea, Keith Hollihan and Donald Ray Pollock are three other writers with new books I would add to this group. While not written for men alone, there is a high charge of testosterone running through the work that cannot be denied. 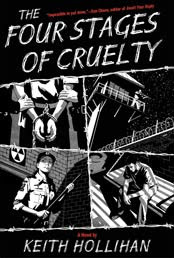 Ben Percy will be reading at the store on Monday December 6th at 7 p.m. and Keith Hollihan will read from his debut novel on Wednesday the 15th at 7 p.m. "The Four Stages of Cruelty" is a stunner of a book filled with moral questions and answers. Please do join us for both--you will not be disappointed.